(UPM, Helsinki, 6 June 2017 at 09:00 EET) - Buses in the Helsinki region and most of machinery and trucks used by the City of Helsinki are switching to waste and residue-based biofuels. Helsinki Region Transport HSL, the City of Helsinki and the producers of renewable fuels involved in the project are all pioneers in carbon-neutral transport. The project is internationally significant. 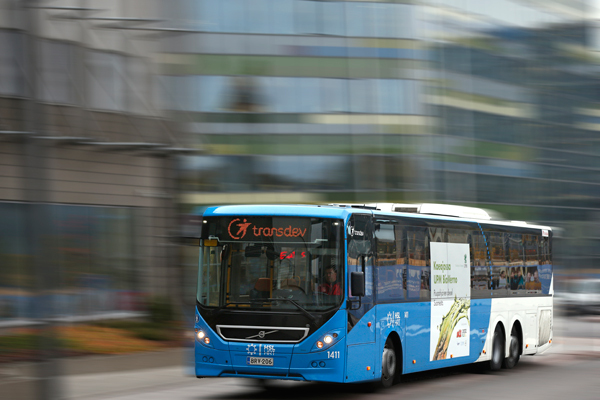 Commercial vehicles operated by the City of Helsinki and bus services commissioned by HSL will fully switch to renewable fuels by 2020. This is a pioneering project in global terms. The construction services company, Stara, which operates most of the city's vehicles, will be involved from the City of Helsinki's side. "Switching to biofuels will markedly reduce carbon dioxide and local particulate and nitrogen oxide emissions. This will have a particularly clear impact on air quality in the center of Helsinki," says Unit Director Sami Aherva, of Stara. "Sustainably produced biofuels are playing a major role in reaching the emission targets of Helsinki Region Transport. The BioSata project could accelerate the transition from fossil fuels," says Reijo Mäkinen, Project Director at HSL. The participation of key players in the BioSata project enable a rapid transition to biofuels. HSL, Stara, UPM, Neste, Teboil, St1, the Ministry for Economic Affairs and Employment, the Finnish Petroleum and Biofuels Association and the Technical Research Centre of Finland VTT are jointly seeking the most extensive possible use of biofuels. The project is part of the Helsinki region's Smart & Clean project, which aims to achieve the most attractive zero-emission mobility in the world. The advantage of high-quality liquid biofuels lies in the fact that neither new vehicles nor a new distribution infrastructure are required. Local emissions can be reduced through the targeted use of biofuels. Particulate emissions can be reduced by up to a third, by using renewable diesel in older vehicles and machinery. At best, biofuels reduce greenhouse gas emissions caused by the production and use of fuel by 80-90 per cent compared to fossil fuels. "Taking into account the number and types of vehicles involved, such as buses, trucks and construction machinery, BioSata is Europe's largest coordinated advanced biofuels project. The project will also involve follow-up measurements. These measurements will cover issues such as fuel performance, impacts on local emissions and energy efficiency, and maintenance needs," says Research Professor Nils-Olof Nylund of VTT, who is in charge of coordinating the project. Vehicles serving on HSL's routes in the Helsinki region include around 1,400 buses, which consume about 40,000 tons of fuel each year. Stara's own vehicle fleet uses around 2,000 tons of fuel a year. About 500,000 tons of biofuel are produced in Finland on an annual basis. The national energy and climate strategy requires that Finland raise the share of biofuels to 30 per cent of all fuels by 2030. Finland is a leading country in the use and development of advanced biofuels based waste and residues. HSL Helsinki Region Transport is responsible for the planning and procurement of Helsinki region public transport and for drawing up the Helsinki Region Transport System Plan. The joint local authority has 360 employees, and its annual turnover is about EUR 600 million. Some 360 million journeys are made on HSL's transport services annually; this accounts for about 63% of all public transport journeys in Finland.